Consume more clean, self generated electricity with battery storage. At Solar and Wind Applications Ltd we believe that everyone should be able to experience clean, green energy from renewable sources. As one of the most experienced Solar PV and Renewable Energy installers around, we will be happy to provide you with a quality service and ensure your energy needs are met for the right cost. The provision of a personalised and professional service is priceless in today’s micro-generator market and we aim to provide you with just that. Our customers think we succeed – see our testimonials for their experiences with us. 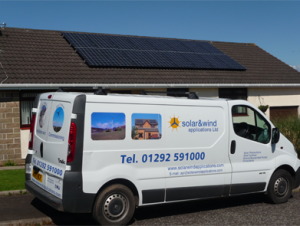 Solar and Wind Applications Ltd are based in Ayrshire but we have installations all over Scotland. With Solar PV and the renewable energy industry being talked about more and more, along with the global requirement for us to obtain our energy from renewable sources becoming increasingly pressing, it is important that we invest in the available technologies now, in time for our children’s future. This is something in which we strongly believe. As well as the benefit of having your own generated power (that can be used in your property) and the electricity import savings from that, there are also financial incentives available funded by the Government. For electricity producing micro-generators (e.g. Solar PV; Wind Turbines), this is called the Feed in Tariff (FiT) Scheme. The FiT scheme gives you an added reward for all of the energy you produce in the form of a payment per unit of energy (kilowatt-hour or kWh). For more information see our section on Feed-in-Tariff. The FiT rates are lower than they used to be. But that does not mean that installing solar PV is now unattractive. Don’t forget, reducing your use of grid electricity means you’re both cleaner AND you’re insulating yourself from inevitable price rises over time. Now with battery storage it’s possible to significantly reduce your import, saving you on your bills. With technology progressing too, you’ll be set up perfectly for smart metering tariffs and leading the way with Electric Vehicles (EVs), charging from your own green electricity! 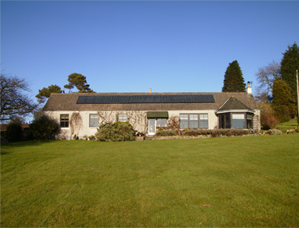 We are one of the longest serving MCS Accredited companies installing Solar PV in Scotland. At Solar and Wind Applications we know that you are making a big step to invest in renewable energy and we want to make the whole process as easy as possible for you. We do not carry out door-to-door sales, cold calling or have any pushy sales staff so it is in our interest to provide you with a high quality service so that you recommend your friends to us as part of our ambassador scheme after your installation is complete. Our team is made up of full time staff from several disciplines, with a wealth of relevant experience and qualifications both with the company and otherwise. We do not employ subcontractors to carry out the work for us. We consider ourselves friendly, efficient and above all professional – this is something that our many previous customers agree with too! Take a look at some of the comments in our Testimonials section. Have a look in the Team section for more info about our key staff and installers. At Solar and Wind we do not see the end of the installations as a parting of ways between us and our customers. We always strive to create a friendly working relationship with you where we are able to provide an efficient, cost effective maintenance schedule (as required) to suit both your installation type and any specific needs you may have. Our vastly knowledgeable staff can be contacted easily and will ensure that advice or a solution is reached promptly – often a plain English technical walk through over the phone or by email from our staff can solve a query. In addition, we are so confident you will be delighted with our service that we run an ambassador scheme – you recommend somebody to us, and if their installation goes ahead we give you a commission for the job.